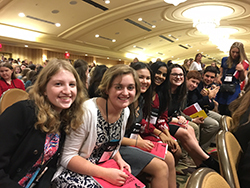 Sayre Strong at KYA 2016! Mitchell Barber '18, Kathleen Beebe '20, Calbi Brewer '18, MJ Farrell '20, Taylor Johnson '17, Vanessa Jones '20, Wrennie Lambert '19, Sierra O’Brien '20, Laiba Rasul '20, Laura Rich '20, Audrey Sams '20, Lauren Shepherd '18, Lucy Sims '18, and Caroline Yandell '20 debated and voted as delegates in legislatiave chambers. 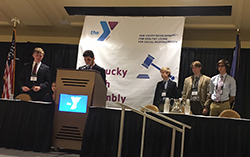 Mohsin Akhtar '18 represented clients and influenced legislative debate through advocacy and networking. Madeleine Bruelheide '19 served as a photographer for the YMCA Youth Association app, web blog, and video platforms. 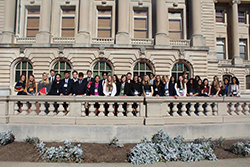 Congratulations to Sayre’s delegation and thanks to its advisors and chaperones Delia Pergande, Linda Beck and Tom Pergande.